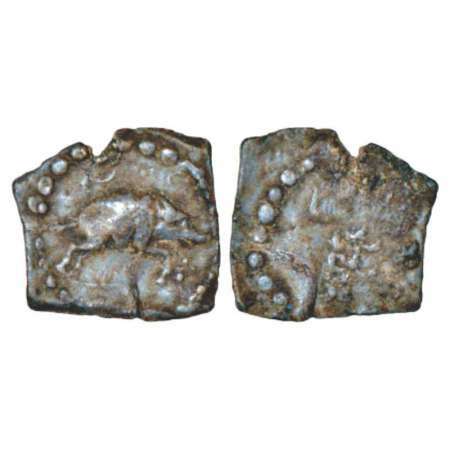 Medieval Gujarat, unattributed 'boar' type lead coin, post- Gupta period (500-600 AD), 2.19g. Obv: Boar running to right, crescent above. Rev: Brahmi legend Shri Maha…. Medieval Gujarat, Vaghela Dynasty, copper coin of Saranga Deva (1274-1297 AD), unpublished in major publications, 2.08g. Obv: Elephant walking to left. Rev: Nagari legend in two lines (Shri Sara)...Deva. South-Central India, anonymous and unattributed gold Gadyana of Rashtrakuta period (700-800 AD), showing designs loosely copied from the gold coins of contemporary Islamic World, pierced twice, 4.60g. 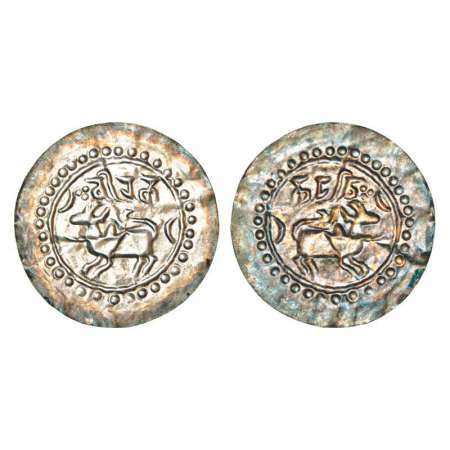 Rashtrakutas, silver dramma of Amoghavarsha (830-870AD), unpublished in major sources, 0.37g. Obv: Elephant marching to right with a rider. Rev: Nimbate Garuda seated in centre; Brahmi legend Shri A mo…. to left. 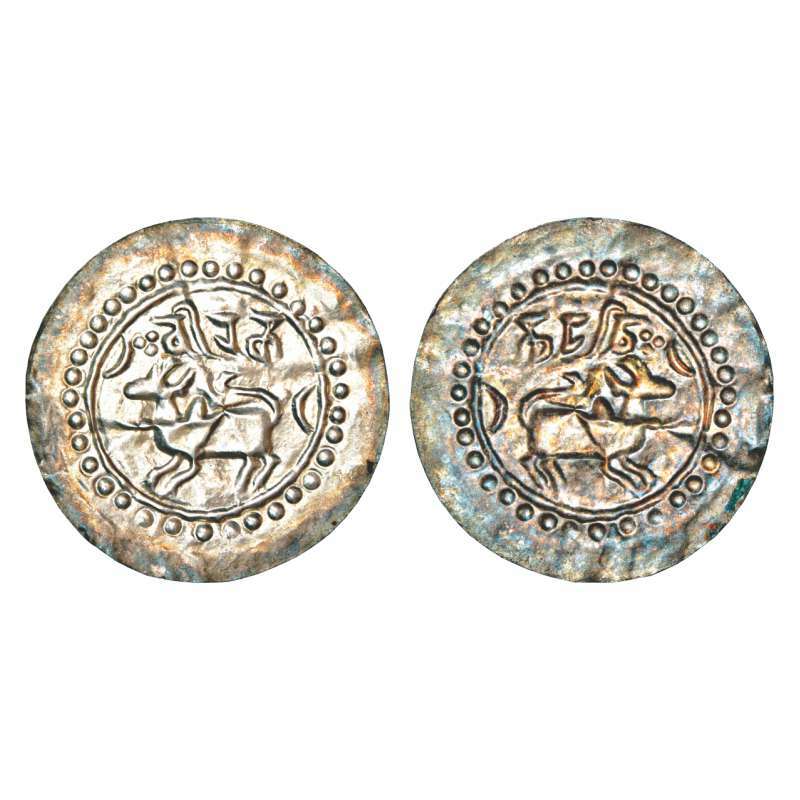 Harikela, anonymous silver bracteate, (10th-11th century AD), citing "Harikela", Mitch-LW: 138, 49 mm, 3.05g. Obv: Bull walking to left, two crescents on either side; Nagari legend Harikela above. Rev: Negative impression of the obverse. 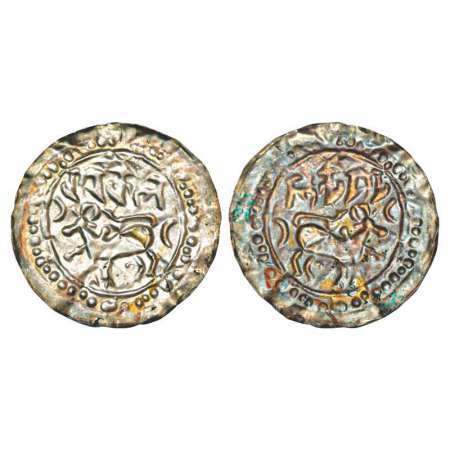 Harikela, anonymous silver bracteate, (10th-11th century AD), citing "Veeraka", Mitch-LW: 143, 49mm, 3.51g. Obv: Bull walking to left, two crescents on either side; Nagari legend Veeraka above. Rev: Negative impression of the obverse. 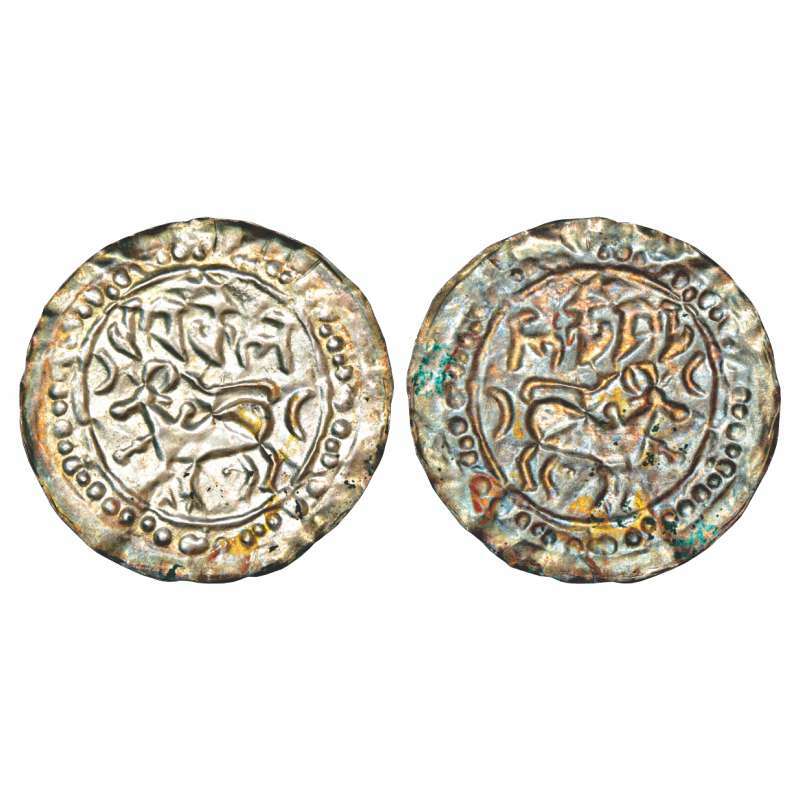 'Veeraka' is said to be for the mint name 'Barak' along the river of the same name. 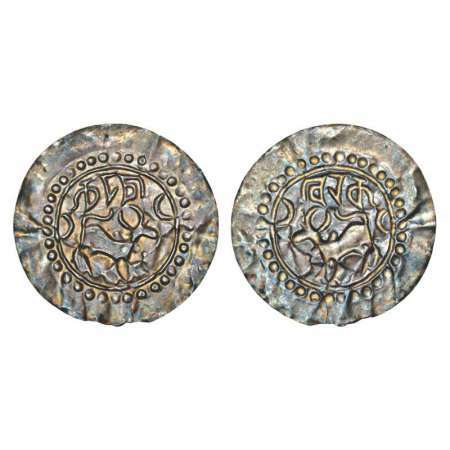 Harikela, anonymous silver bracteate, (10th-11th century AD), citing "Veeraka", Mitch-LW: 144, 50mm, 3.09g. 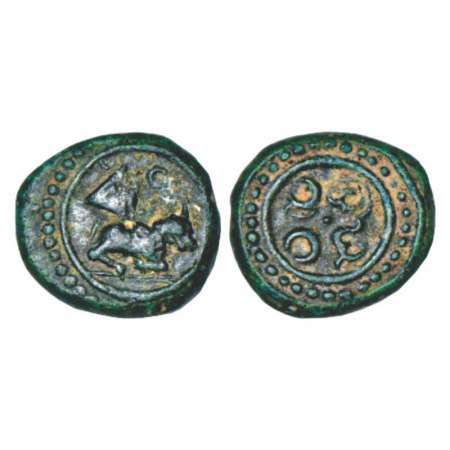 Obv: A retrograde impression of bull walking to left, two crescents on either side; Nagari legend Veeraka above. Rev: Negative impression of the obverse. 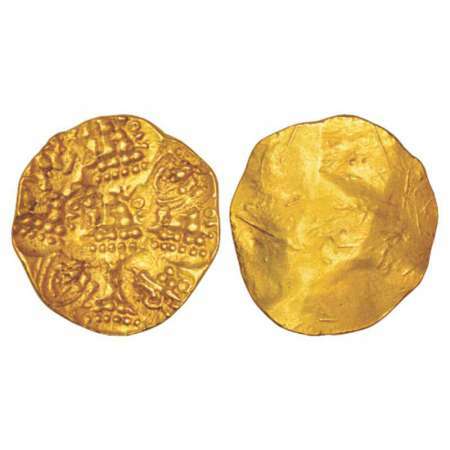 Kadambas of Goa, anonymous gold gadyana (1000-1100 AD), 3.74g. Obv: Majestic roaring lion standing facing left; a temple to left. Rev: Trisula at the top, Nagari legend Shri Malaha/ ramari in two lines with a dotted separator. 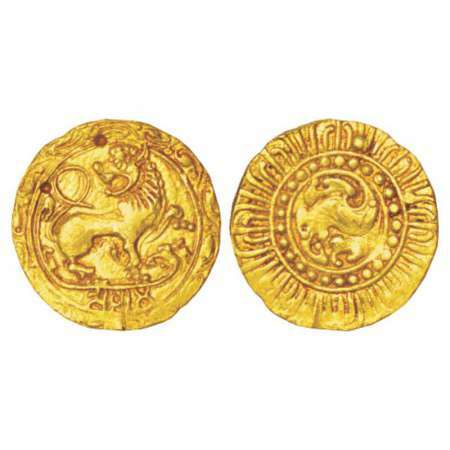 Kadambas of Hangal, gold gadyana attributed to Toyimadeva (1048-1075 AD), 4.28g. 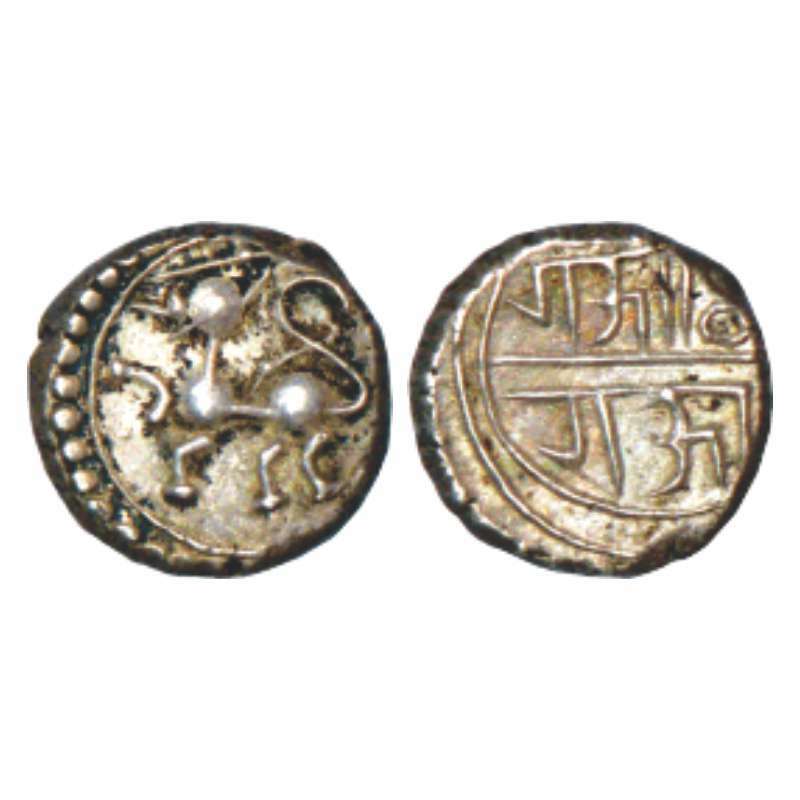 Obv: Majestic lion with mane, holding a front paw aloft, 'regardant en arrière' with tail curled over its back, Kannada legend Saluga? below. Rev: Elaborate floral scroll decorative motif within a 'rayed lotus' border. Two small test mark. Hoysalas of Dorasamudra, gold gadyana of Vishnuwardhana Bittiga (1106-1152 AD), MCSI-I 202, 4.06g. 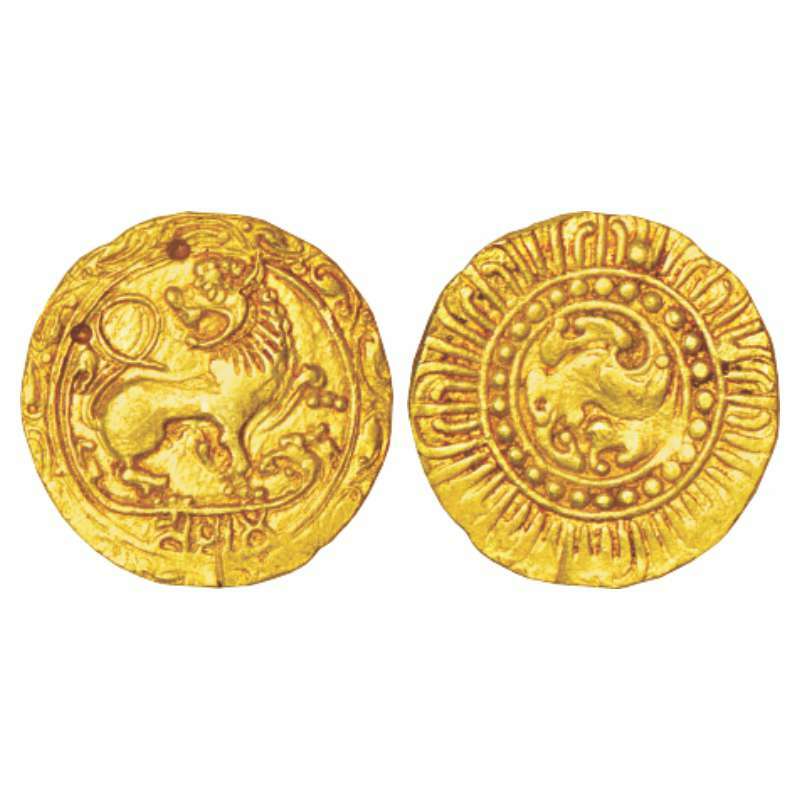 Obv: Mythical lion or 'Sardula' facing right, with a Vaishnavite deity holding Shankha, Chakra and Gada (mace) above it. Rev: Kannada legend Shri Nolambawadi Gonda in three lines. 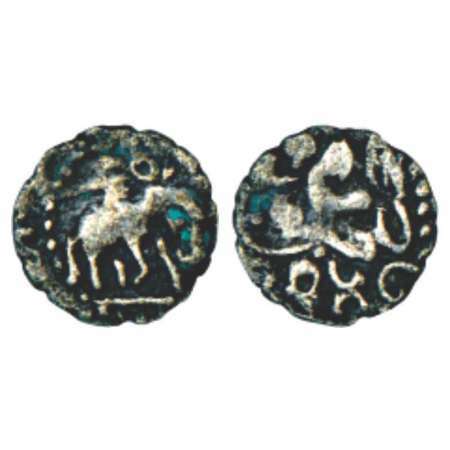 The title 'Nolambawadi Gonda' or 'conqueror of the Nolamba country' was held by Bittiga to commemorate his conquest of the Sira - Madakasire region which happened before 1117AD. 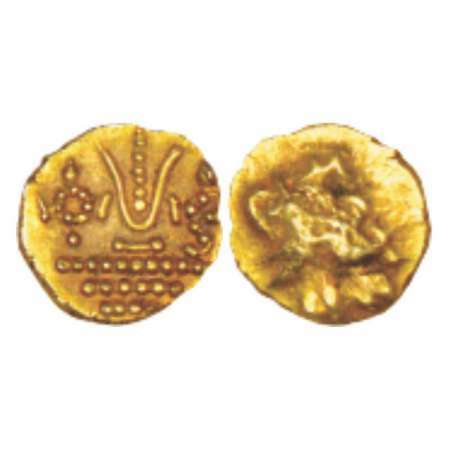 Kalachuris of Kalyana, gold punch marked Gadyana, temp. 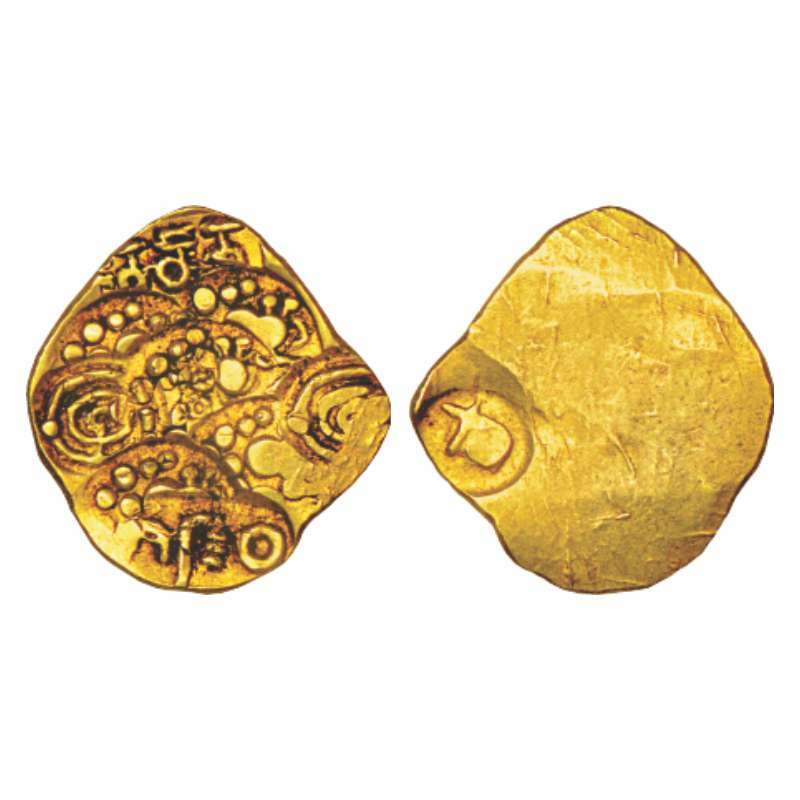 Bijjala Tribhuvanamalla (1156-1168 AD), MCSI 277, 3.45g. Obv: Nine punches: 5x lion; 2x Kannada letter Sri; 1x sun & moon; 1x Kannada legend Katachure. Rev: One punch of a symbol. Nolambas as feudatories of Chalukyas of Kalyani, gold Punch-marked Gadyana with legend 'Bujaba', middle series (12th century AD), 3.58g. Nine punches: 5x stylised seated bull (Nandi), 2x Kannada Sri, 1x Kannada legend Bujaba and 1x elephant goad (Ankusha) on obverse. 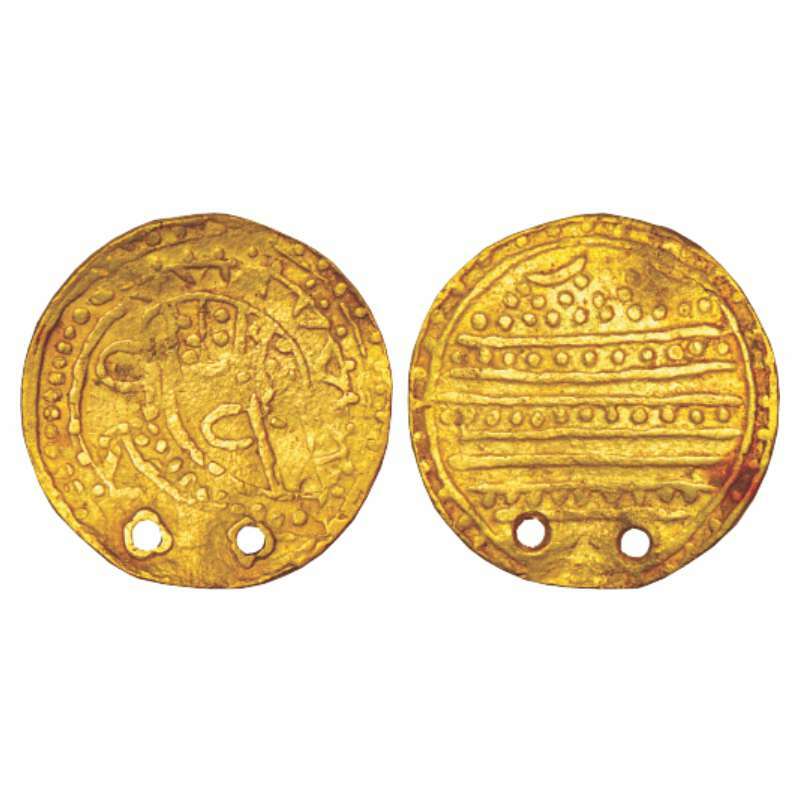 Chalukyas of Kalyani or their feudatories, brass contemporary forgery of a gold punch-marked Gadyana, (12th century AD), 1.78g. 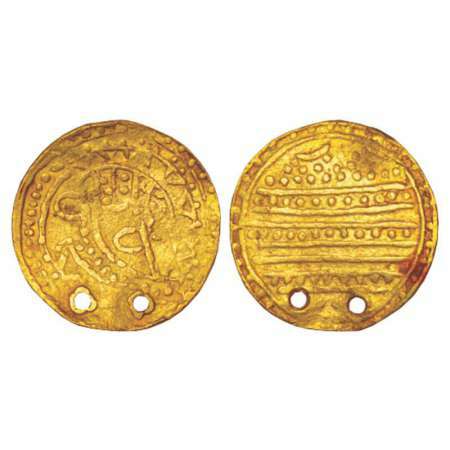 Nine punches, 5x stylized lion, 2x dagger, 1x Kannada legend Kalyana?, 1x indistinct on obverse. 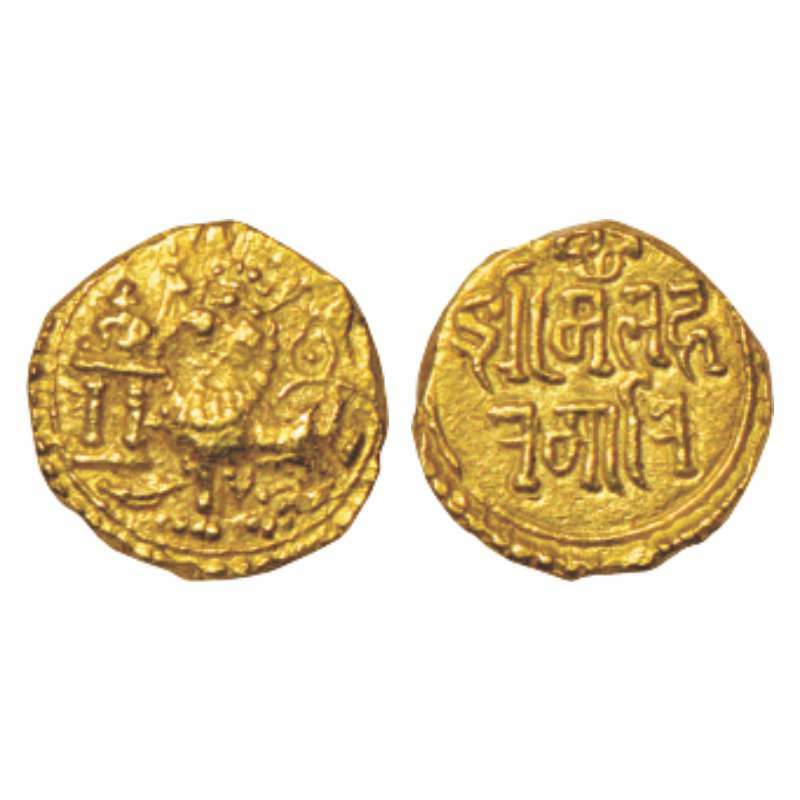 The early Marathi literature of the Mahanubhava sect makes mention of contemporary fake coins in 12th- 13th century. Very few specimens are known that actually corroborate this important evidence for monetary history. This is one such piece and therefore an important object even though it is a contemporary forgery. Feudatory Chiefs of Gersoppa, Nagire, Saluva Malla with the title 'Rajadhiraja', silver coin, 1.43g. Obv: Lion running left with a raised paw. Rev: Nagari legend Rajadhiraja, MCSI-I 333-336. 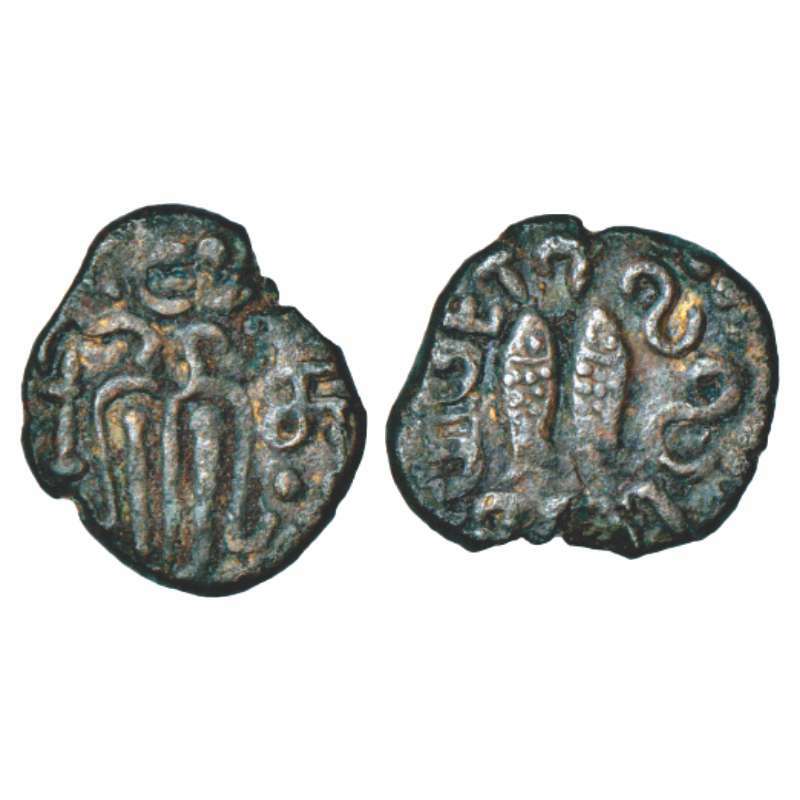 Pandyas of Madurau, copper coin of Jatavarman Sundara Pandya (1251-1283AD), Ganesh 'Tamil Nadu' 2.19, 4.49g. Obv: Stylized 'standing man', Tamil letter Su to right. 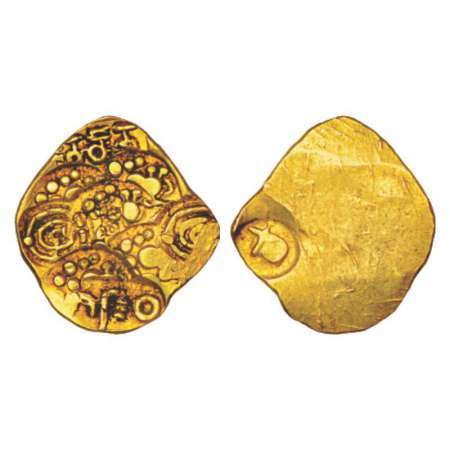 Rev: Pair of fish; Tamil legend Ellantalaiyanan around. 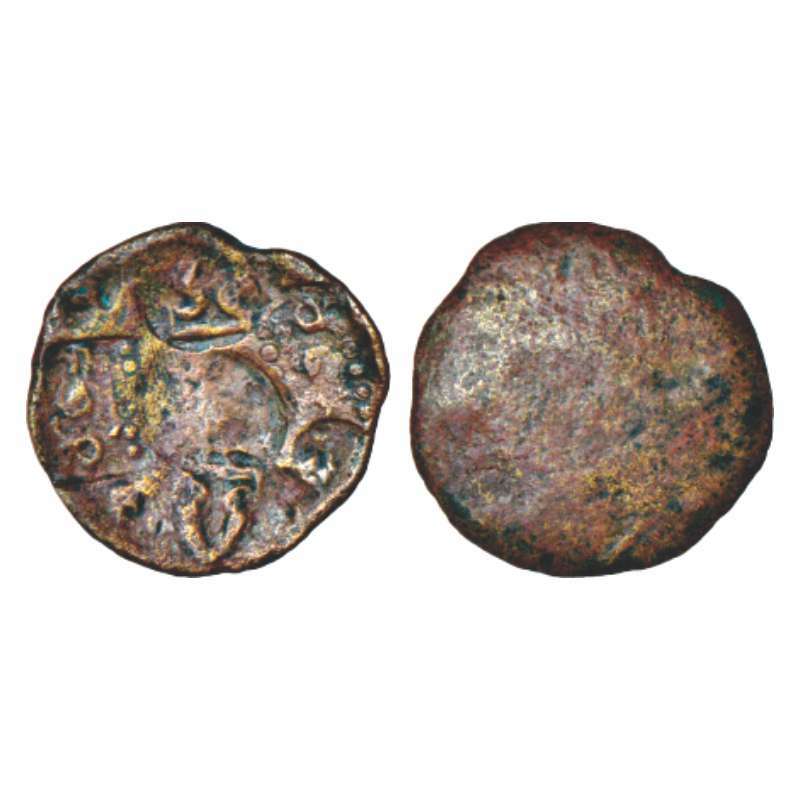 Gohils of Kathiyawad, copper coin of 'Mukharaj', most likely identified as Mokhadaji (1309-1347 AD), 1.99g. Obv: Nagari letter Shri in circular border. Rev: Nagari legend in two lines Shri Mukha / Raja. 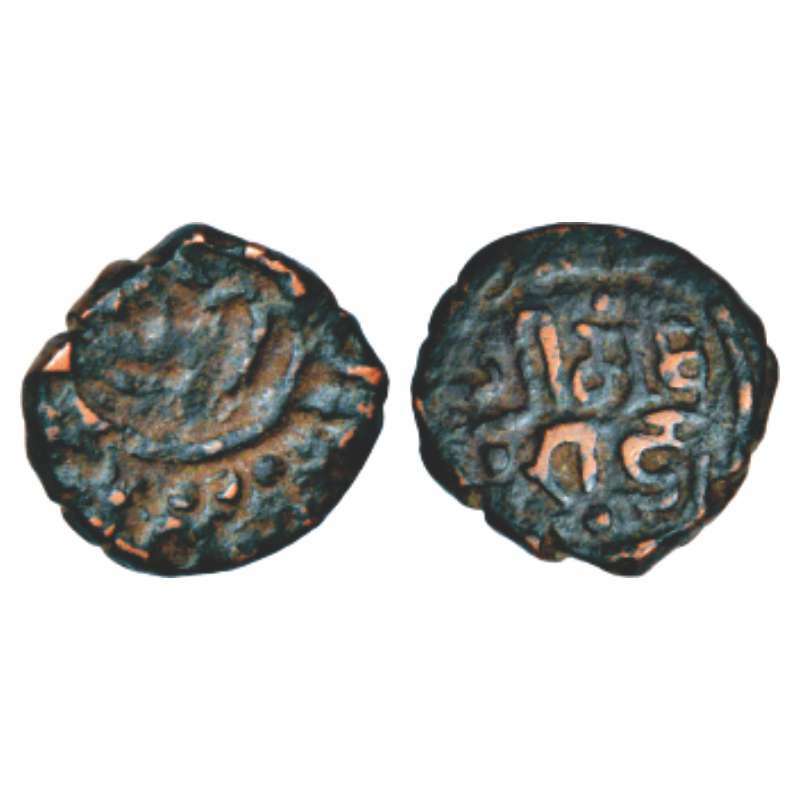 Mokhadaji Gohil was a contemporary of Muhammad bin Tughlaq of Delhi. He tried to expand his kingdom by defeated small neighbouring rulers. He then conquered the island of Piram and also the seaport of Ghogha. His mission was to make seafaring safe for voyagers and traders. However he incurred the wrath of the Sultan of Delhi who attacked him at Ghogha. Mokhadaji was defeated in the battle and killed. 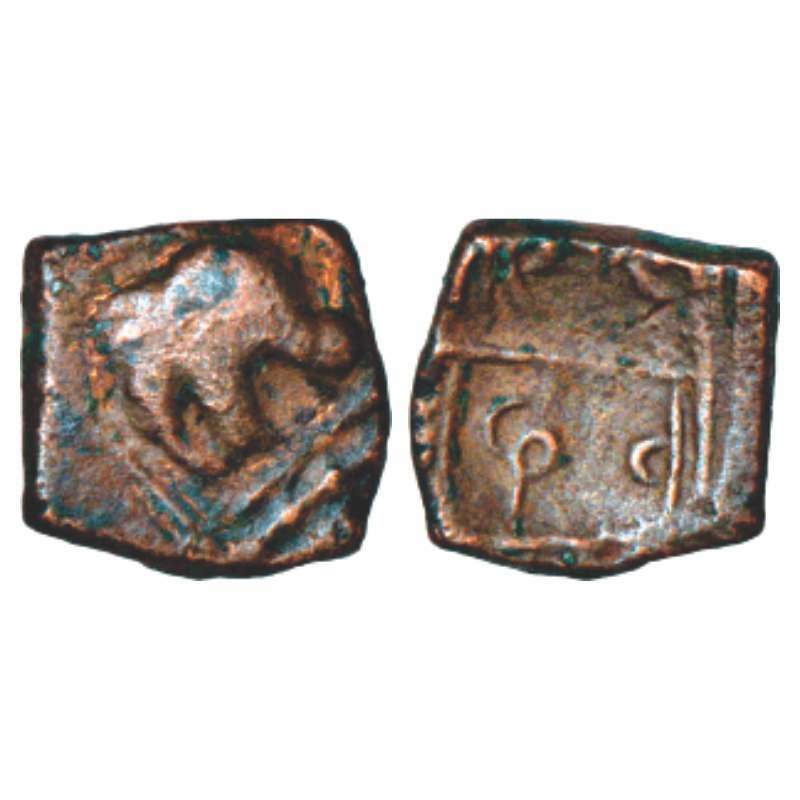 No coins attributed to Mokhadaji are yet known and this appears to be the very first specimen. 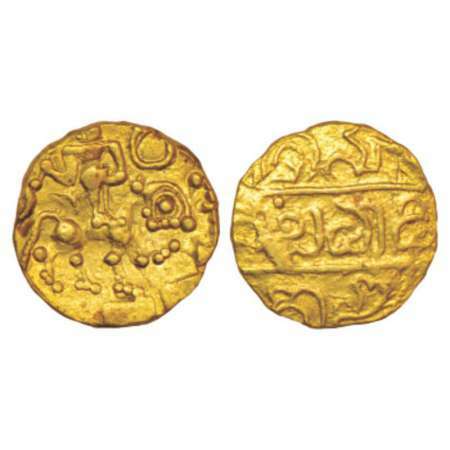 The attribution is tentative but aided by the fact that the coin is very similar to the Chudasama issues of Junagarh, the legend suggests a 14th century date and 'Mukharaja' could well be a Sanskrit form of 'Mokhad', the Gujarati name of the king. Vijayanagar Kingdom, Venkataraya II or III, gold ½ varaha, Girijapati 392-395, 1.73g. Obv: God Venkatesvara standing at front. Rev: Nagari legend Sri Venkate/swaraya/namah in three lines. 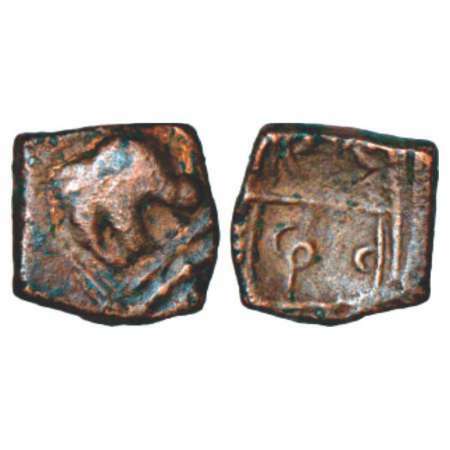 Post-Vijayanagara Tamil Nadu, temple city of Thiruvannamalai, copper coinage (1520-1620 AD), Ganesh Tamil Nadu 13.7, 6.36g. Obv: Nandi seated facing right; two-peaked hill above. A dotted border encloses the motif. Rev: Kannada legend Aru/nadri in two lines within a dotted border. 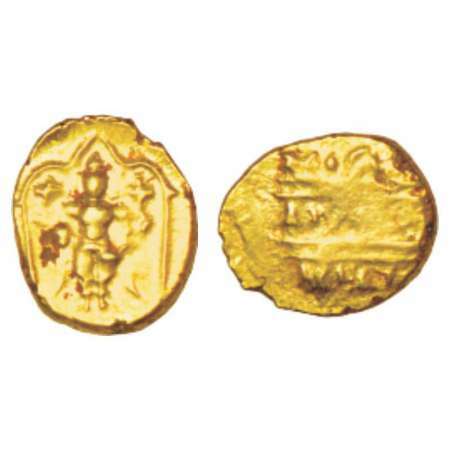 Vijayanagara Empire, late phase as Kings of Chandragiri / Penukonda, gold fanam, feudatory issue in the name of 'Ranga Raya', (1600-1700 AD), 0.38g. Obv: Vadakkalai Namam (Vaishnavite symbol) on a pedestal, flanked by Sankha and Chakra. Rev: Legend Shri Ranga Rayalu in two lines, obliterated by a die flaw.